:Together you can make it through anything. We live in a troubled society, and those maintaining order and justice are some of the most overworked, unappreciated, and underpaid. The nature of their jobs is taxing both personally and relationally. Bulletproof Marriage is a 90-day devotional that applies biblical principles to support and strengthen the marriages of military members, law enforcement officers, and first responders. Each day includes a Bible verse, inspirational reading, quick tips, action steps for both husband and wife, and a prayer. Sometimes the greatest love is not to sacrifice your life but to live a life of sacrifice. Invite God to help you make your marriage bulletproof. 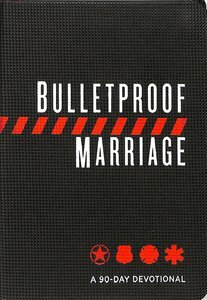 About "Bulletproof Marriage: A 90 Day Devotional"
During his time as a police officer, ADAM DAVIS served in several different divisions including hostage negotiations and criminal investigations before retiring and becoming a business owner and writer. He is the author of Spirit & Truth: 52 Encouraging Messages for America's Law Enforcement. Adam and his wife, Amber, reside in southeast Alabama with their three children and two dogs. Born in Jerusalem, Grossman obtained a B.A. in philosophy and theater at Hebrew University and worked as a news editor and broadcaster for Kol Yisrael (Israel Radio). His concern with the Palestinian problem is reflected in his novels, The Smile of the Lamb and The Yellow Wind, and have helped to make him one of the most acclaimed Israeli writers of his generation. He was awarded the Prime Minister's Prize for Hebrew literature (1984) and the Israeli Publishers Association Prize for best Hebrew novel (1985).